There is an old-time tradition of wearing new clothes to Church on Easter Sunday. The reason that this tradition was started was to show that you promise a new spiritual redemption. There is an Easter parade every year in New York City, and this is where the tradition of Easter bonnets started. People would wear fancy new hats / bonnets to church and then afterwards they would march in the Easter parade while wearing their new bonnet. These days it is hard to find an Easter bonnet as they don't sell them much any more. That is why this page, with Easter bonnet crafts is a great resource. I hope you enjoy the crafts. The pinwheel on this play Dutch Mill Easter Hat will turn around in the breeze. Remove the lid from a quart size ice cream container (after washing it out), and turn the container upside down. Paint the container gray and allow it to dry thoroughly. 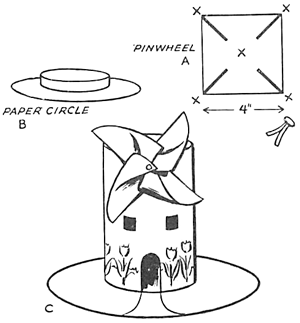 To make the pinwheel, cut a piece of white paper 6 inches square. With the scissors, make 4 slashes in the paper square, one from each corner, as in illustration A. Fold each corner, ( Point X ), one over the other, to the center (Point X ). Force a metal head paper fastener through all four points in the center of the pinwheel, and fasten to the front of the mill. Paint the container lid green and allow it to dry thoroughly. Cut an 8 inch circle from green construction paper, for the grass. Glue the lid, open side up, to the center of the green paper circle, as in illustration B. Place the container into the lid. Paint on green grass and colored tulips around the base of the mill, as in illustration C.
Get a disposable paper plate out. Look at figure 1 above to see how to cut away part of the plate. Cut on the dotted line that you see. Get 3 lace paper doilies - either color them pink or buy them pink. 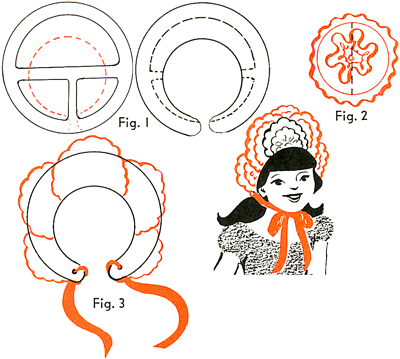 Cut each of these doilies in half and then use 5 of these half pieces to trim the hat as seen in picture number 1. Find some clear tape and fasten in the right place. Find the center of the brim of the heat. Then attach a 7" doily that is colored green or purchased green). Cut away the part of the doily that you don't need. Punch two holes int he back of the hat as seen in picture 3. Run a ribbon or string through the punches holes and tie a bow to wear the pretty bonnet. Beautiful Bonnet Crafts Idea - Follow these instructions to create the most beautiful Easter bonnet you have ever seen. Bonny Bonnet Easter Arts and Crafts Activity - Find out how to make a festive Easter bonnet from inexpensive craft materials. Bunny Ears for Kids - Children love making and wearing bunny ears during the Easter celebration. Bunny Hat Craft for Easter - Find out how you can turn a pink visor into a cute Easter bunny hat. Bunny Hats Easter Crafts Activity - Follow these instructions to turn a straw hat into a bunny hat. Celebrate the Season With our Fresh, Fun Kids' Craft Projects - Learn how to make an easter bonnet from Parents. Chick Visor Easter or Spring Arts and Crafts Ideas for Children - Find out how you can turn a yellow visor into a cute Easter chick hat. Decorate An Easter Bonnet Arts & Crafts Activity - Learn how to make a Easter bonnet by decorating a straw hat with ribbons and fabric flowers. Easter Bonnet Arts & Crafts Project Ideas - Learn how to make this easter bonnet with your children. Easter Bonnet Pin Craft - Make an adorable Easter bonnet pin using a miniature hat and other supplies. Easter Bonnets Arts & Crafts Activity for Kids - Learn how to make Easter bonnets from a paper plate, ribbons, crepe paper, glue, and scissors. Easter Bunny Ears Craft Activity - Your children will have so much fun making and wearing these Easter Bunny Ears. Easter Rabbit Hat Arts & Crafts Ideas - Learn how to make this adorable Easter Rabbit hat with the following directions. Flower Crown Arts & Crafts Easter Idea for Kids - Follow these instructions to make a beautiful flower crown from a paper plate, tissue paper, crayons, scissors and glue. Flowered Easter Bonnet Craft - Learn how to make a flowered Easter bonnet with your children. How to Make an Easter Bonnet Arts & Crafts - Here are a few Easter bonnet crafts for you to choose from.